I love Sushi. I gotta admit I was a bit skeptical about using canned Tuna to make Sushi Rolls. 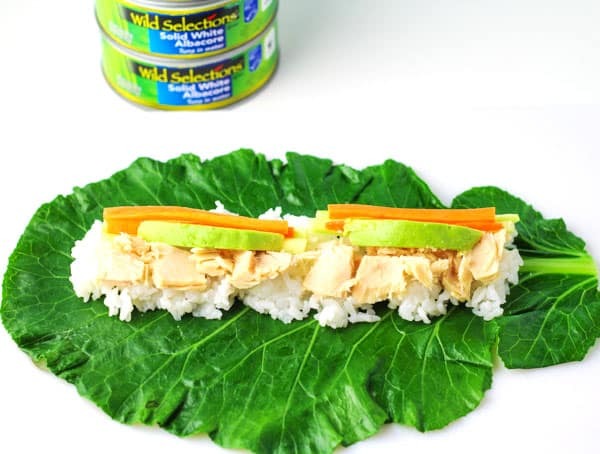 But after opening up a can of this Solid White Albacore Tuna by Wild Selections, I knew right away this would make the perfect Tuna Sushi Roll. The quality and taste of this Tuna is so incredibly yummy! Plus all of their tuna is Non-GMO Project Verified. 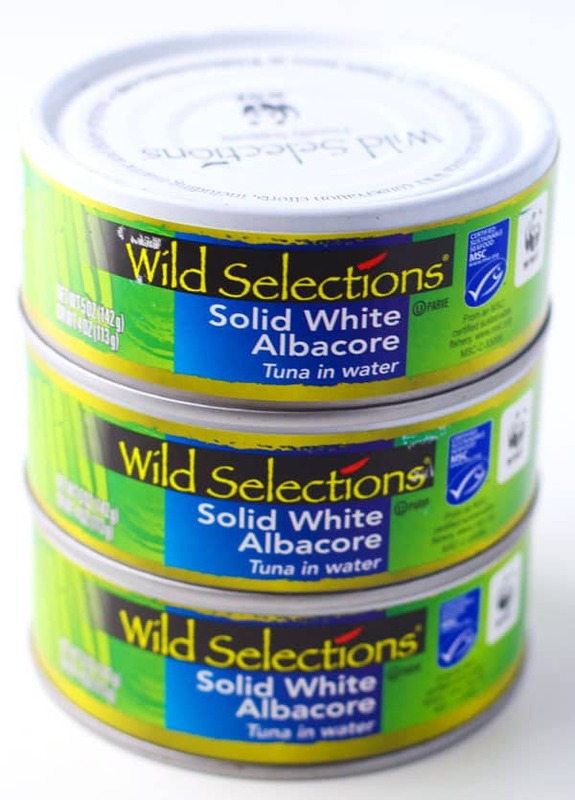 I also think it’s totally awesome how Wild Selections gives back to the oceans by donating 13 cents from every can sold—a total of $1 million by 2018—to World Wildlife Fund marine conservation and fishery improvement projects. Wild Selections is the only brand to “pay it forward” and act on its belief to take care of the oceans for the future, not just fishing sustainably in the present. There is a little prep work to make this, but once that’s done it’s really pretty simple to make. You can actually blanch your Collard Greens, make the Rice, and chop your veggies a day before to save time. Once you have everything prepped, make a little assembly line with all the ingredients. I start by adding the Sushi Rice to the middle of each Collard Green. You can use regular Rice, but it won’t be as sticky. I prefer Sushi Rice because of the sticky texture and the flavor. Plus it stays intact better within the roll. Then add a layer of Tuna. Next add the Cucumber, Carrots, and Avocado. Note: Don’t over fill or it’ll be hard to roll up. Roll each leaf up tightly and slice into 1 inch size pieces. Making the Spicy Mayo is super easy, again you can make this a day ahead of time. Just add Mayo and Siracha to a small bowl and mix together. Note: You can make this a little or as spicy as you want. Just add less or more Siracha to your liking. Add it to a small ziplock bag and cut a small slit in the bottom corner of the bag (makes it like a pastry bag). 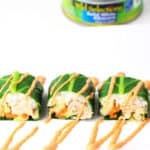 Drizzle Spicy Mayo over the Tuna Rolls and serve! We will definitely be making more of these on Earth Day. Rinse Sushi Rice in cold water for about a minute, drain. Add Sushi Rice and Water to a medium pot, bring to a boil, cover, and turn heat to low cooking for 20 minutes. In a small bowl add Rice Vinegar, Sugar, and Sea Salt. Microwave for 30 seconds until Sugar dissolves, pour over cooked Rice and stir in. To blanch the Collard Greens, bring 5 cups of water to a simmer in a large pot. Cut the thick stems off of the base of the leaves. Use a small knife to trim down the spine in the middle of the leaf. Cut it so the spine is as thin as can be with the leaf. Add the Collard Greens to the simmering water and submerge for 60 seconds. Remove Collard Greens and add them to the ice bath, submerge in the ice water for 10 seconds. 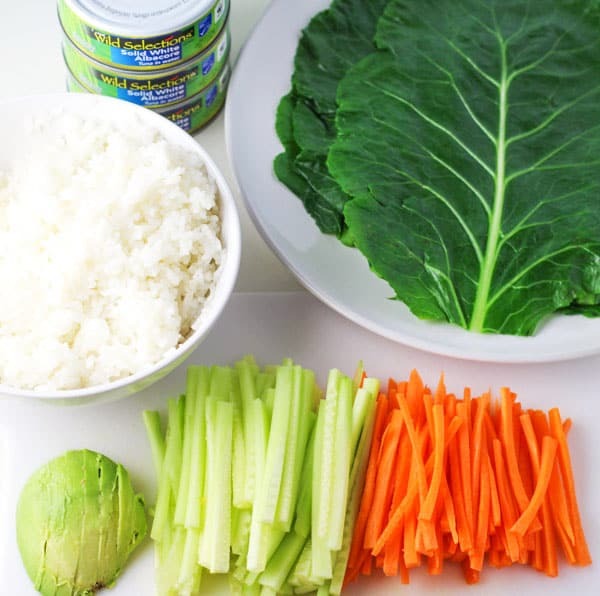 Spread a spoonful or two of Rice on the inside of each Collard Green keeping it in the middle along the stem line. Add a layer of Tuna, Carrots, Cucumber, and Avocado on top of the Rice. Be careful not to overfill or it’ll be hard to roll up. Roll each leaf up and cut into 1 inch pieces. In a small bowl add Mayo and Siracha, mix well. Drizzle over sushi rolls. 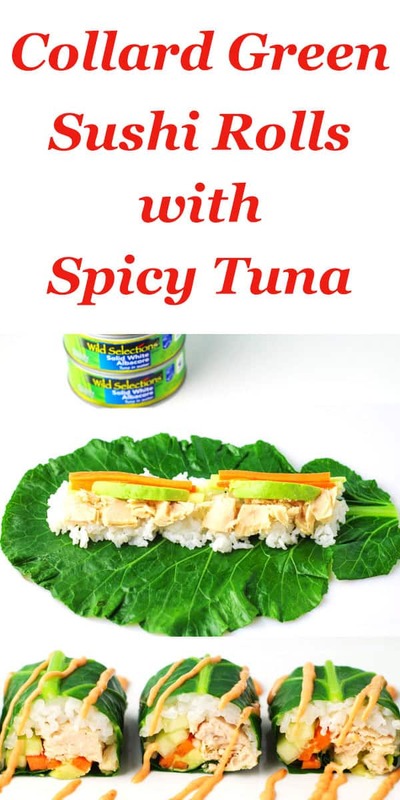 Wild Selections is the best tuna on the market and I love the idea of using collard greens as the wrap. 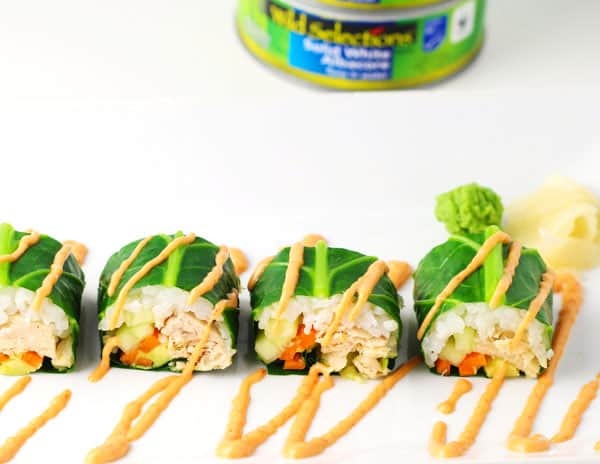 This collard green sushi rolls with spicy tuna looks delicious!!! 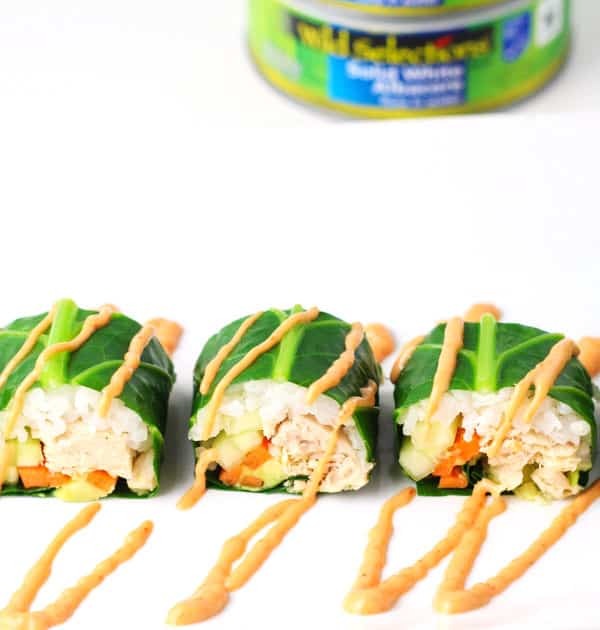 My kids love sushi and they eat it 4 – 5 times a week! I love making sushi at home with my sushi making tools. I will surely try this beautiful recipe and hope that my kids will love it. Thanks for sharing such an amazing sushi recipe.